Decadence incarnate. 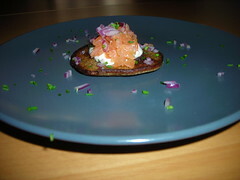 Bilini with creme fraiche, lox, minced chives and red onions. We also had little bilinis with caviar which were heavenly. I will be dreaming of this feast all week!